The 2010 Christmas dinner was held at Jägerhaus Restaurant, 2525 E. Ball Rd. (just west of the 57 Freeway) in Anaheim, CA. The event started at 7 p.m. Tickets were just $24 each for dinner beverage, dessert, tax, tip and one opportunity drawing ticket (Ladies also received a free ticket for the special ladies' prizes). After dinner the good of the club was given to Doug - W6FKX, and the new board for 2011 were introduced. Next the ladies drawing was held and ten lucky women walked qwaya with beautiful baskets filled with all kinds of non-radio goodies. Finally the opportunity dawing was held. Many fine prizes were awarded, including a Yaesu VX-3R handheld, an ICOM IC-V8000 2-meter transceiver and a CQ calendar featuring the PEQ's as the November "centerfold". 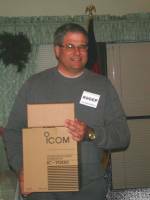 Tim - W6GEP walked away with the grand prize - an ICOM IC-7000. It was great sharing an evening of good food and cheer, club awards and prizes. Wayne Barringer - KB6UJW of the Volunteer Communications Network spoke at our November general meeting on emergency communications preparedness. Most emergency communicator volunteers donate their time, services and resources on a "Call When Needed" basis and are not full-time first responders. Yet if/when they are mobilized, emergency managers, first responders and government officials expect them to perform as a "professional." Any tools that help a volunteer fulfill this expectation and helps to fulfill the mission requirements and incident objectives are well worth the investment. How we perform is how we will be remembered, and this presentation highlighted preparation and pre-departure strategies that will help volunteers to be remembered as professionals. Elections for the 2011 Board were also held at the November meeting. Club members joined Jeff - W6UX and Nicholas - AF6CF at Irvine's Jeffery Open Space Preserve to set up a few solar power amateur stations. Come on down and bring some victuals for a picnic and join the fun. Set up began at 8:00 AM. Weather was a bit windy but numerous contacts were made. This event was canceled due to rainy weather. Dan and Kristin are looking into possibly rescheduling it. PACIFICON presented the 2010 ARRL Pacific Division Convention at the San Ramon Marriott Hotel in San Ramon, CA the weekend of Oct. 15th - 17th. The annual OCARC Auction was held in lieu of our regular meeting. Numerous ham and electronic items were auctioned off, and a good time was had. Chip Margelli - K7JA was emcee and auctioneer. The auction lasted till nearly midnight, The club ended up with a reasonable profit from selling some donated items. SANDARC presented the 2010 ARRL Southwestern Division Convention at the Four Points Sheraton in San Diego, CA the weekend of Sept. 17th - 19th. 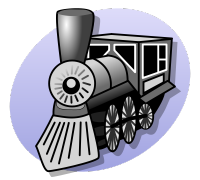 OCARC members Ken - W6HHC and Robbie - KB6CJZ spoke at the September general meeting on digital Amateur TV. First they gave an updated version of their presentation to the 2009 ARRL/TAPR Digital Communications Conference, then they gave a dramatic demonstration of digital ATV, with its near perfect picture. Dennis Kidder - W6DQ was our guest speaker for the August general meeting. He talked on the basics of ham station grounding for electrical safety and lightning protection. Dennis has spoken at our club numerous times; his knowledge and dynamic presentation skills continue to offer us educational and entertaining programs. The Orange County Fair ran from July 16 through August 15 of 2010 at the Costa Mesa Fairgrounds. 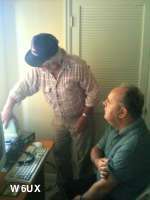 The OCARC club manned the OCCARO Ham Radio Booth for a second time this year on August 7th. The booth won 1st place. Part III of the KI6DHT antenna raising was held on Saturday. Present were Arnie - N6HC, Jeff - W6UX, Phil - KI6VEN, Doug - W6FKX and of course Mike KI6DHT. After a long wait the missing parts for the vertical were obtained. The antenna was taken down, the parts installed, the feedline attached and the antenna re-raised. After six more lowering and re-raisings to adjust each band, the antenna was deemed "good to go", and new black Dacron guys were attached for protection from the upcoming winds. Mike can now be heard on the air working DX and booming into the 10 meter club net! The Orange County Fair runs from July 16 through August 15 of 2010 at the Costa Mesa Fairgrounds. The Orange County Amateur Radio Club manned the OCCARO Ham Radio Booth on July 21st, the first of two club dates. Members interacted with the general public promoting the hobby we all so dearly love. July's program detailed the triumphs and pratfalls of the 2010 WY7FD operation from high above Sundance, Wyoming. K7JA, KL7MF, and a gang of locals from the Devils Tower area joined forces to battle rattlesnakes, snow, and antelope in ARRL's popular end-of-June event. Chip Margelli - K7JA put on an entertaining presentation with lots of spectacular photography of their 2010 FD operations. And no they never saw a single rattler! Celebrate the birthday of our Country (as well as the birthday of the assistant Webmaster). Have a safe long weekend. There were no club events planned for the weekend so members could spend time with their family. The Orange County ARC will operated Field Day over the weekend of June 26th and 27th. Setup started on Friday afternoon the 25th. Our site was the Walter Knott Elementary school property in Buena Park. Operations began at 11:00 AM local time on Saturday and continued until 11:00 AM on Sunday. Teardown started right after the contest ended and a group picture was taken. We were torn down, packed up, and the area policed for trash by 1PM. The club made 513 CW contacts and 1,718 phone contacts; in addition the GOTA team (Boy Scout Troop 788 from Torrance, California), under the leadership of Brett - W6BAC made an additional 158 phone contacts and 2 digital contacts. AMSAT area coordinator Clint Bradford, K6LCS, presented his 'Working Amateur Satellites With Your HT' multimedia session at the June 18, 2010 meeting of the Orange County ARC. Prior to the meeting he gave a demonstration of working through a satellite out in the parking lot. "I am looking forward to speaking to this club," Clint wrote. "It is one of Southern California's region's oldest amateur radio clubs with over 75 years of history." At the meeting he told us that the OCARC has been an ARRL affiliated club since 1934! Download Clint's four-page tutorial and radio programming matrix at http://www.work-sat.com. Charles Basham - N6DZW of Southern California Edison spoke on electrical safety for the radio amateur at our May general meeting. Charlie has 30 years experience with SCE, and has been a radio amateur for 45 years. He is Edison's public safety manager, and has earned more than 100 national and regional awards for his many accomplishments in safety communications and related subjects. 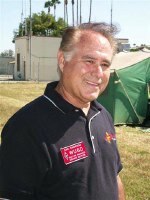 Charlie is the national chairman of the Utility Public Safety Alliance in Washington D.C. and holds or held numerous similar positions over his career. Due to the two conflicting events, this was an abbreviated meeting. The club showed a DVD video about the Queen Mary and its world renowned ham radio station - W6RO. The Queen Mary, being permanently moored at the Long Beach harbor, is a local Southern California attraction that features a hotel, restaurants and shops, ship tours and of course W6RO, which is located in the Queen Mary's original radio room. The video is narrated by Nate Brightman - K6OSC, and produced by the ARRL. Many OCARC club members supported the Orange Police Department in the annual Baker-to-Vegas relay race. Law enforcement agencies from around the USA, and by invitation from around the world, participate yearly in this 120 mile, twenty segment, foot race that runs from outside Baker and goes through the towns of Shoshone and Pahrump, and ends at the Las Vegas Hilton Hotel. The Orange Police Department finished 41st overall out of 251 entries, and 6th in their class. Many OCARC club members made the trek to Visalia, CA this weekend for the 61st Annual International DX Convention. Big guns from around the world gathered to talk and plan about the hobby they love. Part II of the KI6DHT antenna raising was held on Saturday. Present were Arnie - N6HC, Jeff - W6UX, Phil - KI6VEN, Bob - AF6C and of course Mike KI6DHT. This week the 'previously owned' Hy-Gain 640-AV antenna was found to be short a few parts. 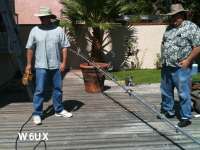 Arnie's DX-pedition talents came into play when he got the antenna together sans a few parts and temporarily missing 6 meter capability. As the sun set the antenna was installed on the base. Next session will be to add the feedline, raise the antenna a few feet for additional clearance and perhaps install the missing parts. If you'd like to help, contact Arnie or Mike. A group of OCARC hams met at the home of Mike - KI6DHT to prepare the foundation for his vertical antenna. Present were Arnie - N6HC, Jeff - W6UX, Ken - W6HHC, Phil - KI6VEN, Bob - AF6C and of course Mike KI6DHT. 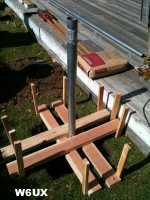 With sunny eighty-degree weather, the hole was dug, the lower mast set in place, and the concrete mixed and poured. 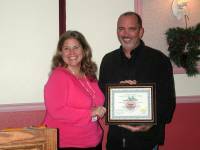 Orange Section Manager, Carl Gardenias - WU6D was our guest speaker at the March meeting. 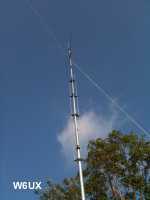 He talked on a 160 meter antenna he recently erected. He also updated us on a program bringing youth into amateur radio. 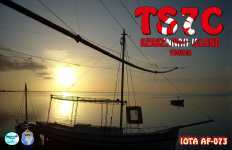 Bob Grimmick - N6OX, spoke on the TS7C DXpedition to Kerkennah Island, Tunisia? The expedition took place in January of 2009 and included some seasoned and newcomers to the DXpedition world. Despite custom problems that delayed access to their radios, many thousands of QSOs were made on the ham bands, including a record amount of RTTY DX contacts. Our own Arnie Shatz - N6HC talked on the DXpedition that put Midway Island back on the air. If you worked Midway - K4M - in October, Arnie told us of the operation from the other side at our January meeting. Dec 11th***, Nov 13, Oct 9th, Sep 11th, Aug 14th, Jul 10th, Jun 12th, May 8th, Apr 9th, Mar 13th, Feb 13th** and Jan 9th*. ** Effective February 2010 the breakfast was moved to the second Saturday of each month. *** The December 11th breakfast was canceled due to the Holiday Party being held the night before.